Reviews on TripAdvisor and other review sites can make or break a hotel’s chance when it comes to a guest booking a room. Reputation Management is an important part of any hotel marketing strategy, and there is no doubt that you want to keep your stars as close to 5 as possible. If you have just purchased a hotel or you are a completely new management company taking over the property, there is no doubt that you don’t want your property penalized by mistakes and other factors performed by previous owners and management. 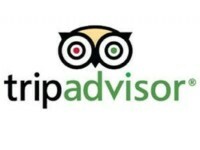 In fact, TripAdvisor understands the importance of your property’s reputation management, and has a process in place to assist new owners from suffering the consequences of negative reviews or outdated photos of the hotel due to previous ownership. 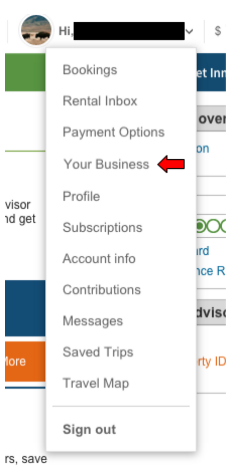 The first thing you have to do is login to your TripAdvisor Business Account. 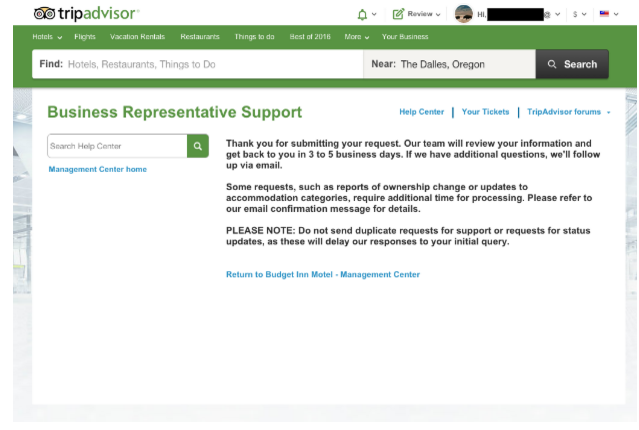 If you don’t currently have a TripAdvisor Business Account, you are going to need to create one. Visit https://www.tripadvisor.com/Owners. 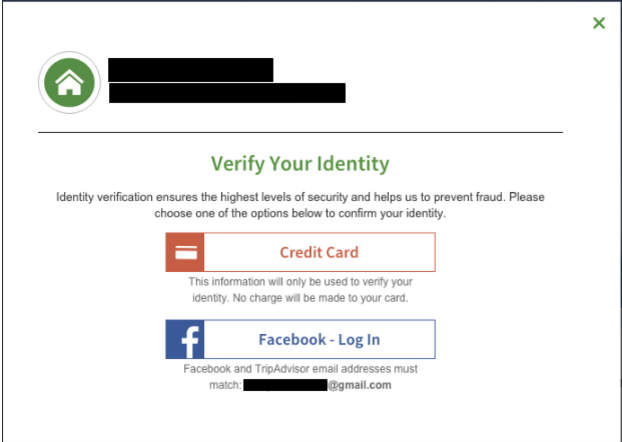 Keep in mind that you will have to verify your identity in order to create an account. You can verify either with a credit card or by connecting your Facebook page. If you verify with a credit card, you will not be charged. 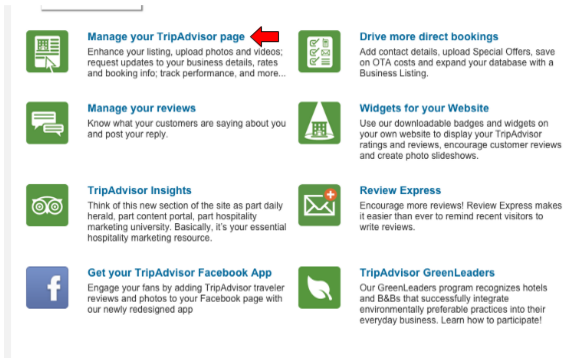 Under the Manage your TripAdvisor page, you’re going to take a look at the links on the bottom left hand column. 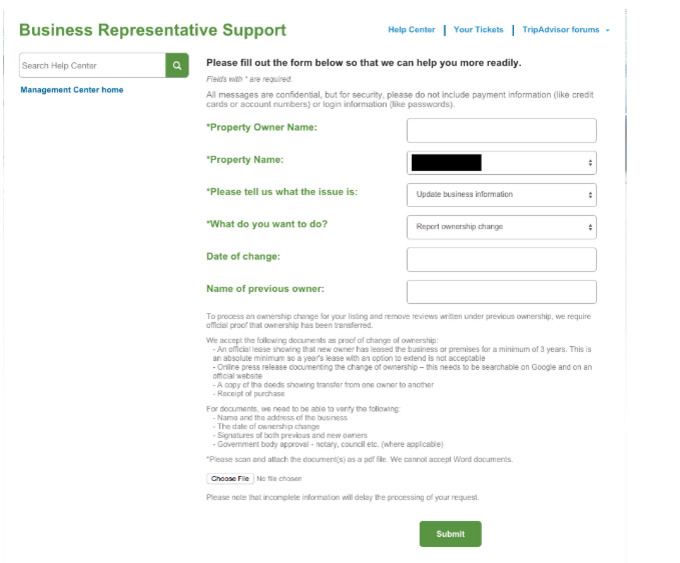 Click ‘Report Ownership Change.’ This page is also useful if you’re looking to report a business closure, location change, duplicate listing, among other things. You will be required to fill out a form with all of your hotel’s information including the property owner name, property name, date of change, and pervious owner if you have that information. Leave the drop down menus as they are. After you fill out the necessary information, you will need to provide documentation that shows proof of ownership change. A document such as a purchase agreement will work just fine. Scan any documents as a PDF and upload them. Click Submit. Once you you hit submit, you will receive a confirmation that states your request will be reviewed within the next 3 to 5 business days. Keep an eye out in your inbox for an email from TripAdvisor. If you have provided sufficient documents and your request is approved, you will receive an email like the one below. And that’s it! 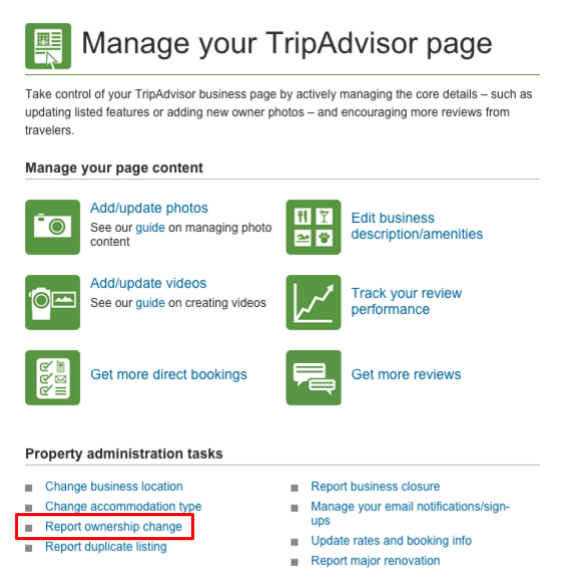 It’s a good idea to submit an ownership change if you are looking to remove older reviews that do not reflect the current state of the hotel. In order for your hotel's reputation to improve, it is important that you make use of TripAdvisor.